It's time to say goodbye to traditional candles that melt, drip, smoke, risk of fire while working! HOMEMORY dripping wax style LED tea lights help you create a warm and romantic ambience like real candles do in any events! *Brighten your home with these romantic, safe and elegant fake votive candles without any mess or hazardous flames associated with them. *Flame simulation technology makes these battery led candles flicker, brings the most realistic experience to any room. 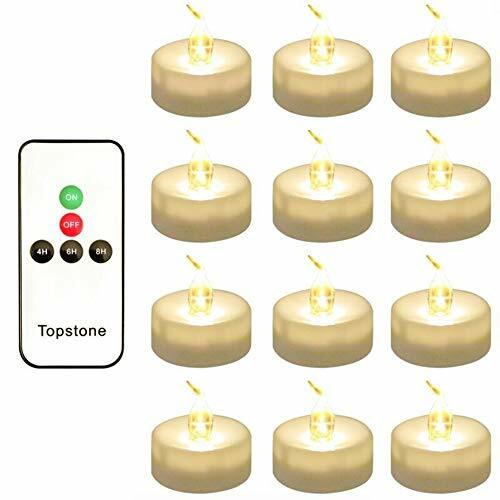 *One remote works with all the LED flickering tea lights(same series) at once or separately. Turn them all off or on at the same time. *Set 4H/5H/6H/8H timer to make these battery-powered candles turn on and off automatically. *Excellent decor items for wedding receptions, dinner parties, holiday gatherings and other events. *Remember to remove the plastic insulation sheet from the bottom of the flickering tea lights and remote control. *Before you use the remote control, switch the ON-OFF button to ON at the bottom of the LED candles. *The top of the amber yellow tealight is waterproof but the bottom isn't. Please keep them away from water. *Please place the LED Candles out of reach of children, to prevent children from swallowing any parts of these candles. *Using the timer mode will shorten battery life slightly, as they use battery to stay active, enabling to receive signal even when the candles are turned off with remote. Therefore, if you are not using these candles for a long time, please switch them to the "OFF" position manually at the bottom to save battery life. 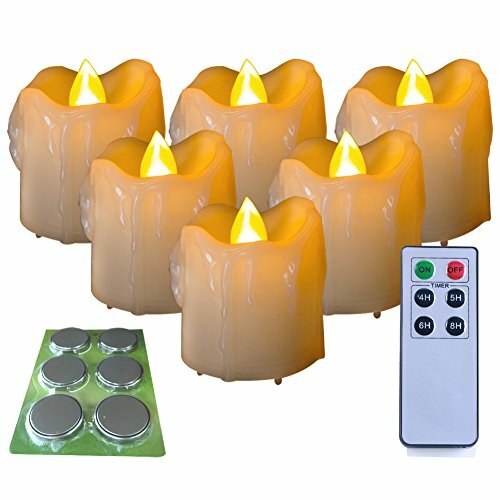 6 INSTALLED BATTERIES & 6 EXTRA BATTERIES: Long-life, energy-efficient, and environment-friendly votive flameless candles powered by one single CR2450 replaceable button cell (included), estimated to last over 150+ hours. Surprisingly, there are 6 extra batteries. Use again for free when the batteries run out! If you are not using tea lights for a long time, please switch the LED candles off at the bottom to save battery life. HIGH QUALITY FLAMELESS CANDLES: We use top notch high-end wax-like plastic to replicate the feel and appearance of real wax candles. Each electric candle measures at 1.5 x 1.7 inches, making it a perfect fit for most candle holders. Ideal for parties, wedding, birthday, home decor, restaurants, and table-top decorations, etc. 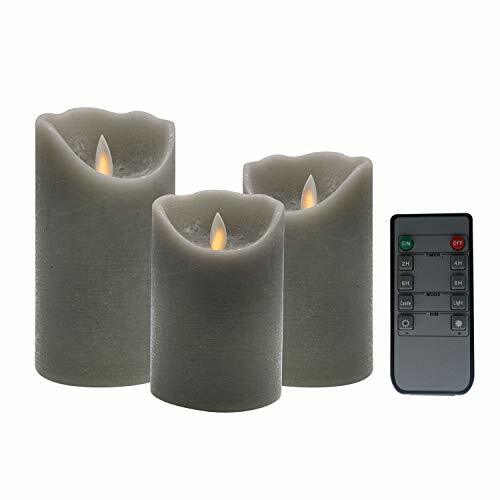 Package include: 6 x votive candles; 6 x installed batteries; 6 x extra batteries; 1x remote. REMOTE CONTROL WITH TIMER SETTING: 6-key remote control allows you easily operate from the comfort of your sofa or bed or set timer on your flameless candles per 4H, 5H, 6H, or 8H, while you can even time them to automatically turn on or off, and cycling 24 hours. With this super convenient remote you can enjoy the relaxation of your candles without worries. SAFETY COMES FIRST: With these realistic dripping tea lights you can have perfect ambient evenings with peace of mind; no worries about fire hazards, smoke, messy dripping wax or stained tablecloth. These kid-friendly flickering flameless candles are a great choice for any family with children or pets who want to make sure that their little ones will stay safe and sound. 100% SATISFACTION GUARANTEE: All the flameless candles are thoroughly and rigorously tested and sold exclusively by Homemory. If you are not completely satisfied with your purchase simply let us know and you'll be offered a full refund or replacement. No question asked. Enjoy this Absolutely RISK FREE Purchase Today by Clicking the Yellow ADD TO CART BUTTON Above. Warranty: One-year risk-free and hassle-free manufacturer's warranty. 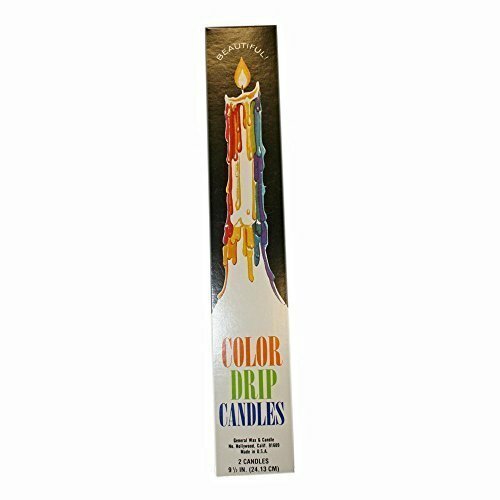 Color Drip Candles may look white on the outside, but once they start to melt layers of brilliant colors are revealed. Two candles per package. 9 1/2" long. Color Drip Candles may look white on the outside, but once they start to melt layers of brilliant colors are revealed. Two candles per package. 4 packs 8 candles total. 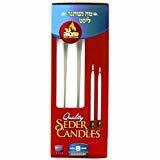 Ner Mitzvah Passover Seder Candles, Burns 8 Hours - 4 candles per pack"
Kitch Aroma Grey Gray Flameless Candles give you all of the ambiance and realism of traditional open-flame candles without any of the usual drawbacks. Enjoy the romantic glow of dancing, flickering flames without unpleasant scents or waxy odors, or the inconvenience of wax that trickles onto surfaces. Feel free to leave Kitch Aroma Flameless Candles unattended in any room, even in the presence of children and pets, without concern that an open flame could cause burns or fires. Kitch Aroma battery-operated Led Flameless Pillar Candles open a world of possibilities for decorating and entertaining. Application: This set of 3 flameless pillar candles highlights a marble inspired design perfect for contemporary settings. Ideal for enhancing tabletop surfaces or adding some style to a mantle display. 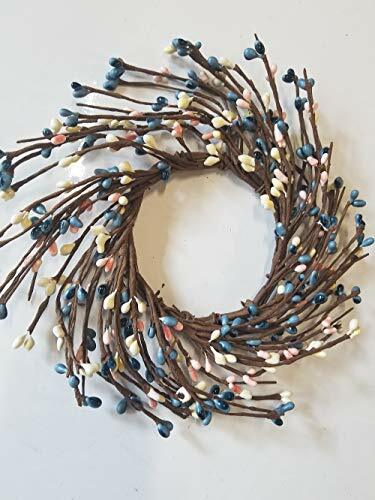 Great for Festival ,Holidays and Christmas too, these candles are the perfect decorating prop during the holiday season. Battery: Each Candle requires 2 AA (1.5V) Batteries (all batteries without included). 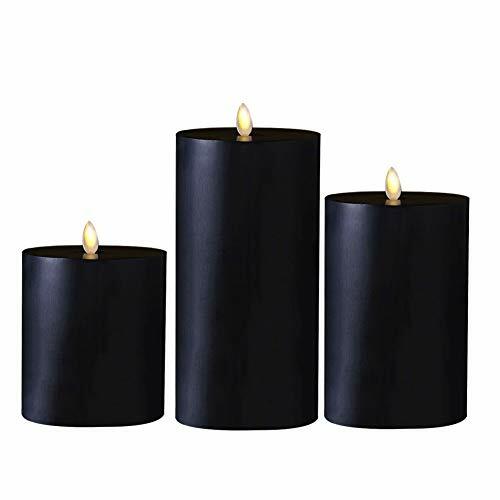 Product Features Features 3 contemporary, wax water wave grain flameless candles with a warm yellow glow,worry free .Very nice and reasonable. ENERGY SAVING, POWERFUL LEDS : 3 x Kitch Aroma Dancing Flame LED Candle(Diameter: 3.15 x H 4/5/6), 1XRemote Control,1 x Manual.Use of 2 high-grade AA batteries that will provide 150 hours of continuous ambience. AFTER-SALES SERVICE IS GUARANTEED : 7 days after receipt of any quality problems can contact us for free replacement. AMIR 9PCS Remote Controlled Flameless Candles are flameless, energy-saving candles. They are made of plastic, no heat or no smoke, safe to use. Together with the remote control and timer, allow you to set the modes of the candles for your preference. There are 5 levels of brightness, you can choose either dimmer or brighter, and you can have candle flickering or straight light. The speed of flickering can also be set. 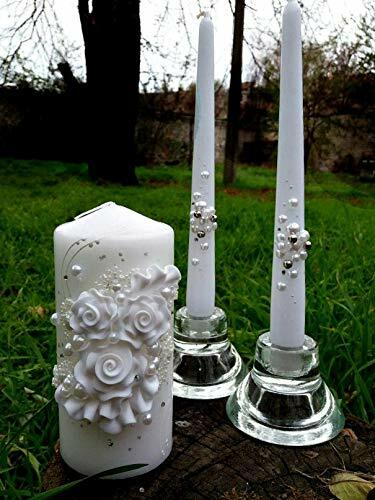 The candles are versatile for various occasions, such as used in Christmas party, restaurants romantic dinner, wedding, festival decorations, etc. - Size: Diameter 4cm/1.6inch+ Height 4.5cm/1.8inch. - Battery: CR2450 button cell. - Battery life: around 120 hours. Don't leave it in or near high temperatures above 45 degrees as this could cause the casing to deform. Romatic & High Quality - AMIR flameless LED tea light candles create the glowing and flickering effect like a real candle. The warm white light are ideal for decorations. Perfect for Christmas, Party, Birthday, Home decorations, Bars, Wedding, Seasonal & Festival Celebration, Gift, etc. 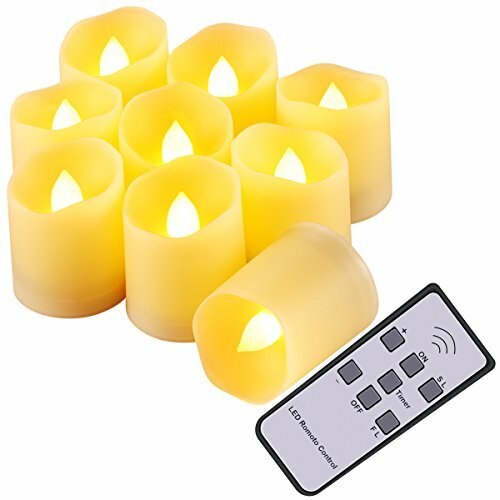 Multi-Functional Remote Control - Control your flameless candles within 5m/16.4ft. Functions include: ON/OFF, Intelligent 6hr Timer, Flickering Speed Setting, 5 Levels Brightness choose. The variety of functions allows these candles to be personalized at your preference. Safe to Use Safe to Use - Made of plastic, set of 9 High Quality battery-operated led tea light candles give you a realistic appearance without the fire hazards, smoke or messy dripping wax. Absolutely safe for families with pets or young children. No worry forget turning off the candles and ensure longer working time. Energy Saving - Made of PP, powered by 3V Lithium CR2450 battery (included), no heat and wax, it is environmental-friendly and safe for decoration. Low battery consumption ensures that each individual candle can light up for 120 hours. Wide Purposes - You can put the LED candle lights on the table directly, or use it as a mood lights/ night lights by putting it in holders like glass cups. If you're not completely satisfied with your purchase, please feel free to contact us, we provide 100% Money Back and ONE YEAR Guarantee. Please enjoy this absolutely risk-free purchase right now! Etronic Real Wax 3D Dancing Flame Flickering Flameless Battery Powered LED Pillar Dripless Motion Candle is the solution to all your decorative lighting worries. It provides clean, romantic, safe and elegant solution without any mess or hazardous flames associated with them. Only romance, no fumes, no wax mess, 100% safe with no flame no heat given off. The flameless LED candles flicker and glow just like traditional candles and look more beautiful. Can be used indoors or outdoors as Birthday candle, Party candle, Wedding candle, Christmas candle, Decorative candle, etc. They're perfect for events where children might be present or outdoor events where wind may cause problems. Precise stimulation crafted wavy edge looks exactly like real traditional pillar candles. Made from premium unscented paraffin genuine wax. Real wax LED flameless candles present a realistic natural appearance without the fire hazards, smoke or messy dripping wax. Incredibly realistic 3D dancing motion amber glow yellow flame simulation technology makes the candles sway and flicker so convincingly. Random flicker and ambient glow. If this product fails due to a defect in materials or workmanship at any time during the life of the product, Etronic will replace it free of charge. This warranty does not cover products which have been abused, altered, damaged, misused, cut or worn. Please contact us via email if you have any questions. Precise stimulation crafted wavy edge looks exactly like real traditional pillar candles. With an uneven top, this piece gives the impression of a melting wax candle, thereby making it look real. The random flicker and ambient glow of this candle give it an undeniably natural look. 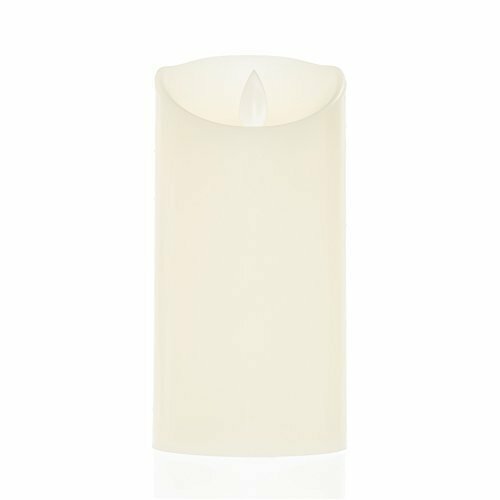 This lovely flameless candle is cylindrical in shape and has a firm round base that stays on any pedestal. Warranty: If this product fails due to a defect in materials or workmanship at any time during the life of the product, etronic will replace it free of charge. This warranty does not cover products which have been abused, altered, damaged, misused, cut or worn. Motion faux flame with realistic amber flickering light to mimic the light of a real candle. With its black , our paraffin-wax flameless candle is a perfect addition to a seasonal display. Set of 5 Advent candles includes 3 purple, 1 pink and 1 white candle. 10" wax tapers, 7/8" base. Made in the U.S.A. The Advent wreath is the traditional centerpiece of the Christmas season. A candle is lit on each of the four Sundays preceding Christmas. Three candles are purple or blue and one is rose or pink. The first candle represents hope. The second candle peace. The pink candle, generally lit on the third Sunday of Advent, represents joy. The fourth candle signifies love. Some Advent wreaths include a fifth white candle signifying "Christ" which is lit at Christmas. Create a warm glow throughout your house with Bright Glow Candle Company's Saints Collection Devotional Prayer Candles. Our LED candle is battery operated and is safe to use anywhere in your home. LED bulb flickers and moves giving a life like effect and will not overheat. Leave candle on for a 7 day continuous glow or turn on candle for 4 hours each day on a 24 hour cycle. Prayer candle highlights the Guardian Angel on the front and a prayer to the Guardian Angel on the back written on both English and Spanish. Bright Glow Candle Company's Devotional prayer candle is perfect for a prayer alter, mantle piece, or for any room in your home. Number one Flameless LED Prayer Candle with automatic timer/auto shutoff. AA 1.5V Battery operated LED Religious Candle with a built in timer. A safe alternative for anyone wishing to have a constant light but worried about having an open flame for an extended period of time. Product size: 8.18" x 2.24" x 2.24"
Vela de Oraci n sin Llaves LED con temporizador autom tico / apagado autom tico. AA 1.5V Bater a LED veladora religiosa con un temporizador incorporado. Una alternativa segura para cualquiera que desee tener una luz constante pero preocupada por tener una llama abierta durante un per odo de tiempo prolongado. Instrucciones f ciles dentro de la caja. Tama o del producto: 8.18 "x 2.24" x 2.24 "
Flickering Light Motion Resembles a Real Candle! Brand: Bright Glow Candle Co. | Manufacturer: Bright Glow Candle Co.
the Topstone LED tealight candle can stay lit for well over 100 hours. And it's a great value and ideal for weddings, restaurants and parties. no more black smoke or flame, nothing to clean up. The long-lasting LED bulbs have an average life time of 200,000 hours. (your replacement depending on the quality of the batteries).